Here's an idea for a physical device that's "on the shelf". From January 2007. Back in 1999 I worked for Bertelsmann Ventures (now BV Capital) in Santa Barbara, California. The office was in a really cool location (just off State Street), on the second floor of a really great building (above the Wine Cask restaurant). Lot's of dark wood and character. The Geochron is the only instrument of its kind to simultaneously exhibit the current time anywhere in the world as well as displaying where the sun is rising, and when it will set. Each gear is individually hand-cut to ensure optimum synchronization. Each world map is made using state of the art lithography printing which uses specially formulated inks designed to make the map resistant to ultraviolet light. Fast forward to January 2007. Digital picture frames were a big consumer craze. These were $100 to $200 devices that would sit on your desk and show you a slideshow of photos. I thought there might be an opportunity to create modern version of a GeoChron, one that would be perfect as an executive gift or desktop accessory. I called it GeoClock. My "GeoClock" design. It says "ambient" in the top-right corner because I pitched the device to David Rose, CEO of Ambient Devices. David had experience designing, manufacturing, and distributing hardware devices at retail stores. I sent him a "prototype" which was an off-the-shelf digital picture frame with a number of still images in sequence, "faking" what the real product would look like. I figured I could sell this thing for $200 to $300 dollars. I didn't know much about the hardware costs, but I assumed that the components were very similar to the digital picture frames: a display, some kind of processor, some memory. 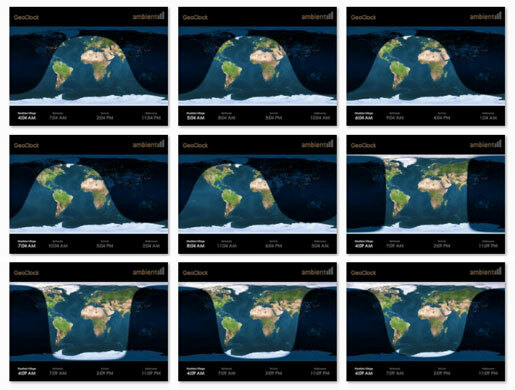 And of course, some custom-developed software that would render a picture of the earth, draw the declination of the sun, refresh the display every x seconds, etc. Has the time for a product like this passed? It seems like digital picture frames came and went. I assume it's because 1) they're rather wasteful (always on, drawing power) and 2) the image they produce fades and degrades over time. Clearly this would make a great app for Android, iPhone, iPad. A quick search in the Apple App Store lists a number of them with similar features. A platform for online marketplaces could be huge given all of the hype regarding "Reverse-Auction" style transactions. The platform would allow buyers to specify items they are looking for, and sellers would place bids/quotes on these items. The buyers would choose the seller that offers the best prices, guarantees, shipping, etc. Like Moai Technologies Auction platform, this tool would be the transaction enabler for Online Marketplaces. When the seller replies to an item, the tool would be smart enough to ask the seller the most important information regarding the item (for example, a television: screen size, PIP, remote control, etc.). When viewing the bid, the buyer would see all of the most important features, as well as the asking price for the exact items from the top sellers in the market (for example, curcuit city, best buy, etc.). This would justify the value of the offer. The tool would create a profile for sellers, including ratings and past-buyer comments. Although there will ultimately only be a few successful reverse-auctioning sites for each market (historical examples for Auctioning model include: Ebay, ubid, Yahoo Auctions, etc), this tool has high short-term value as an easy way for different players to jump into the market quickly. It's the equivalent of the "tool supplier" during the "Gold Rush" analogy, where the majority of the Goldminers made very little money, while the "tool supplier" did very well. Mobile telephone network companies (Sprint PCS, Pac Bell, LA Cellular) charge little or nothing for their hi-tech phones so long as their customers sign a lengthy contract (1 year +) for their phone network. Film Developing providers, such as chain stores like WAL-MART, K-MART, RITE-AID, etc could charge little or nothing for appealing film cameras so long as their customers sign a lengthy contract for film developing with them. Getting cameras in the hands of users can increase the potential that they take pictures, and the providers could increase revenue in film developing just like cellular telephone providers have increased revenue with more network use (more calls made). This also greatly increases the "walk-in" sporadic business of the chain store, as both dropping the film off and picking up the photos are a store visit (which is probably why most stores offer the service to begin with). The problem with the idea is that the film developing providers have no way of enforcing that users develop their film only at their stores. However, the same problem exists with the Free/Cheap PC idea, in that the end users don't have to use the set-up ISP or start page portal. The film development providers can enforce a certain number as the "minimum allowable film development" per year. This idea assumes that photo-processing is something that chain stores anticipate existing for years to come. However, new digital means may allow end-users to "process" photos on their own. Ideally, no processing would be required in order to capture photos.